The Stage was built in 1802 as a Coaching Inn and was originally known as the New Inn when it opened in 1803. The New Inn was advertised as being entirely new with well fitted commodious accommodation for the Nobility, Gentry and Commercial Travellers together with ample stabling. At this time, the bridge over the River Welland crossed at almost a 90-degree angle from the site of the present day bridge so coaches travelling to and from London via the Great North Road (now the A1) into Peterborough and onto Market Deeping would actually enter directly into the New Inn courtyard. The New Inn continued to be a popular meeting place through the years, with functions of every description being held there. In 1974 the brewers, Watney Mann, embarked upon a great conversion program which took around nine months to complete, at a cost of some £30,000. The former coaching entrance became the main doorway leading directly onto a large bar area. Much of the original stonework and beams were retained as were the boot scrapers on each side of the doorway into the bar. 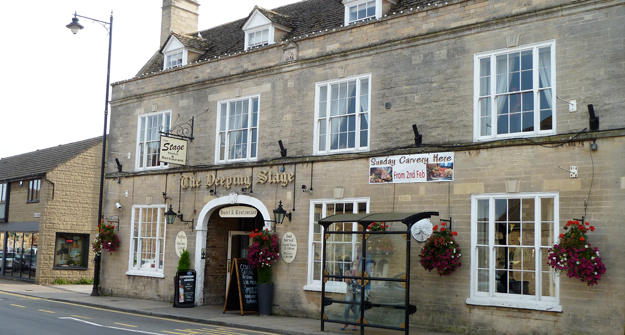 When the conversion work was completed in 1975 the New Inn was renamed 'The Deeping Stage'.There have been many changes over the past 40 years culminating in the Stage you see today, however, despite this fact, the heritage of the Stage has not been forgotten.